Discussion in 'Events and Tournaments' started by Ody, Mar 8, 2019. Hello, and welcome to the second season of League of Toys. This is a very old tournament we first made back in 2018, January 7. 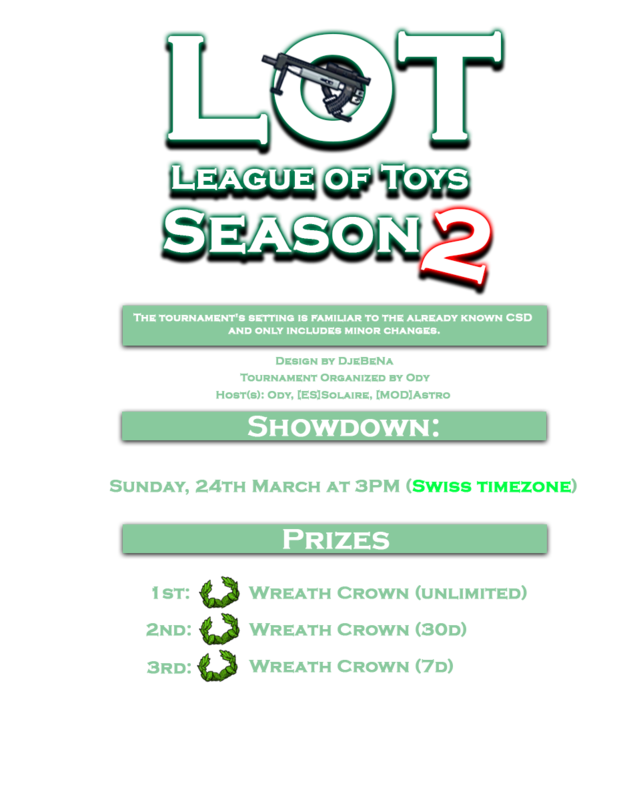 You can find the old thread (Season 1) at https://www.toyheroes.net/forum/index.php?threads/league-of-toys-lot-season-1.1344/. This is not a clan-based tournament. Streamer(s): The tournament will not be streamed, but recorded and uploaded later. The following video made up by @Flexouz explains how everything works if you don't understand. RESERVE PLAYERS ARE ALLOWED TO GET THE PRIZE ONLY IF THEY PLAY 1 GAME. We accept the rules and will be available at written hour and time. If a registered team does not show up, the first alternative team will be chosen. - In case of a draw (Elimination), the match will be played again and the points will be sumup. - In case of a draw (Bomb battle), the missions will be sumup. - If your team doesn't show up at 3PM, we have the right to replace you with the first Reserve team. - account sharing during the tournament is not allowed! - max ping limit was set to 400 ms. People playing with a higher ms will have 10 seconds to leave the match or their team will get DQ. - warping is forbidden. If your MS jumps here and there (egg from 50 to 150 in 1 second) you'll get 10 seconds to leave the match, otherwise you and your team will get DQ. Beware that some rules might be changed soon. I was thinking to randomize the teams to make this tournament totally fair for everyone, but I'm not sure yet. What I mean by this is "mixing" every player in different teams composed by 5 people. What do you think? This might not be done though. I will probably check every player skill and see if the teams are too unbalanced before doing so. Don't randomize, stupid idea. You're saying that some teams are too powerful? And that you want anyone to get a chance. You're writing like people bang this game 8hours a day. And I cant really see a team that is "less good" than any other team signed up already. You sign up for this to play with your friends not with randoms. Thats my opinion at least. May I ask in what way you consider this being a good idea? In what world do they mix up teams because one team is better than an other? This would take away all the teamwork and the work behind the win, it would be completley wasted. I am sorry if I offend you but I can't see how this idea can be even considered to take place. Thanks for your two cents. I already gathered enough opinions, and decided not to proceed with said idea. But I might change some rules to make this tournament as fair as possible later. Nothing too drastic, though. By the way, I am still waiting for a reply by a staff member to make this official. I am also thinking about the date, so I'll add that later. - One/two hosts to help me organize everything. You should have hosted atleast a tournament before, though. - A streamer (but this is for later). If you like streaming and would like to stream this even, contact me privately. That would be a huge help. The team limit won't be added until I see how many teams will signup, but my estimation is 8 for now. Will you set the date next week? Enough with teams & I hope you remember that people hate waiting for a tournament which will be played in 3-4 weeks after the post has been made. Aida and Arata like this. Team limit is set to 16. The date is 24th March, which is a Saturday. The tournament will start at 3PM (15:00 for EU), Zürich timezone.